FUE hair transplant is a hair restoration technique that is minimally invasive and scar free procedure. This procedure is carried out in many specialized clinics in Leeds. As the treatment is non-stitch and have no aftercare, you can get back to day to day activity right after the treatment. FUE hair transplant is safe and comfortable procedure and it is one of no-stitch techniques. In this treatment grafted follicular units are implanted in the balding area. One of the most important benefits of this is that it reduces the possibility of scars and gives the best result in terms of hair density. The method is useful in dealing with pattern baldness also called androgenic alopecia. Eligible candidates for this treatment are the one who suffers from hair thinning and not complete baldness. The best way to determine the candidacy for FUE hair transplant is through a consultation with the surgeon or the dermatologist. FUE hair transplant is performed under local anaesthesia. It is a stitch less method of hair transplantation in which hair follicles are extracted from the donor area (back of the head) with the help of special micropunches and then implanted into the targeted area. Lack of proper supply of quality head or beard hair and blood. After the surgery you can use Rogaine or Finasteride to reduce hair loss in future and to add extra benefit. Men often suffer from male pattern baldness. The causes of hair loss in men are many such as disease, stress, physical reactions to medications, etc. FUE hair transplant is a wonderful option for those men who want to gain their confidence and self-esteem back. A number of reasons are attached behind the female hair loss such as traction alopecia, stress, hormonal imbalances, etc. FUE hair transplant is a suitable option for women who are suffering from hair thinning or female pattern baldness. Thanks to the technological advancement, FUE hair transplant is effective and convenient and provide quick results. At Leeds, people who are suffering from hair thinning or other kinds of hair loss issues can opt for FUE hair transplant. 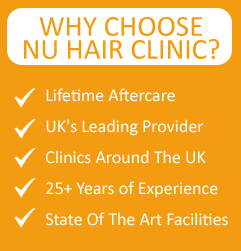 Nu Hair Clinic is one such place that offers state-of-the-art facilities and professional guidance. The expert practitioners here provide free consultation so that you can know how FUE hair transplant works best for you.